Don’t speak, just send a picture. Chat rooms with one simple rule, dubbed “solitary chat rooms,” are gaining popularity among young Koreans. Solitary chat rooms are part of the open chat rooms offered by mobile messenger KakaoTalk. Anyone with a KakaoTalk ID can enter the chat room and join the conversation via the open chatting service anonymously. 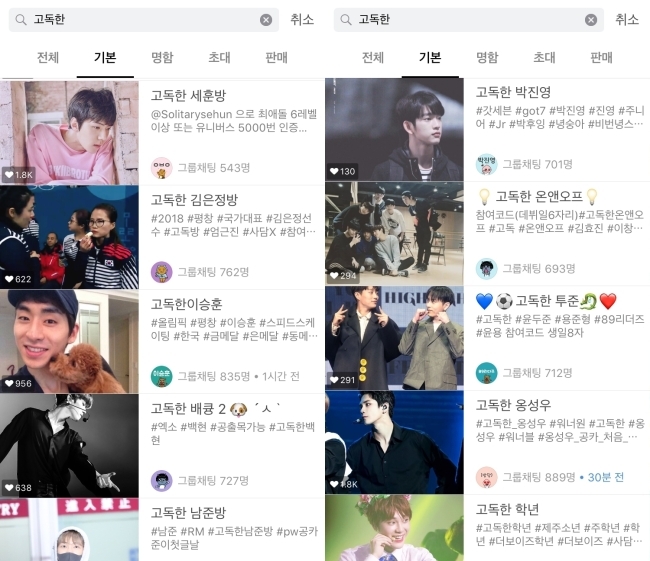 Each solitary chat room has its own distinctive theme, with most being the name of a celebrity in Korea. Users who join the chat room are prohibited from speaking a word, but allowed to send pictures related to the celebrity. If a user sends a text message or emoticons, the manager of the chat room kicks the member out. 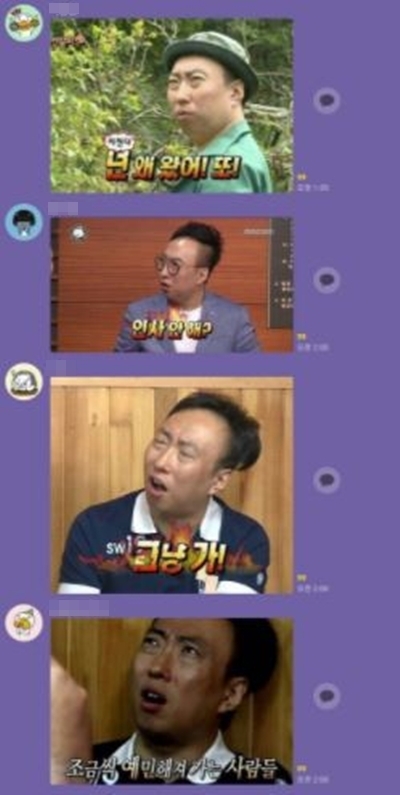 In a solitary Park Myung-soo chat room, for example, users talk with each other using memes of Park. It might seem difficult to continue the conversation, but captions on the memes and the facial expressions of the comedian help users get by without verbal expressions. The term “solitary chat room” was coined after Japanese TV show “Solitary Gourmet,” as members of KakaoTalk’s open chat room “gourmet solitary chat room” invented such rules and started the conversational trend. After the advent of the gourmet solitary chat room in late 2017, chat rooms with similar rules mushroomed on the open chatting platform. When the keyword “solitary” is searched for on the platform, a seemingly endless stream of chat rooms pops up, including for EXO and BTS. According to local media reports, there are more than 10,000 “solitary chat rooms” on the platform. The chat rooms have 700 members on average, while each room can take in a maximum 1,000 people. Some of the rooms require a password to get in. The passwords are often related to the celebrity, such as the birthday of the singer or debut date of the actor. Sometimes the actual celebrities join the chat rooms to talk with the members, who are mostly fans. 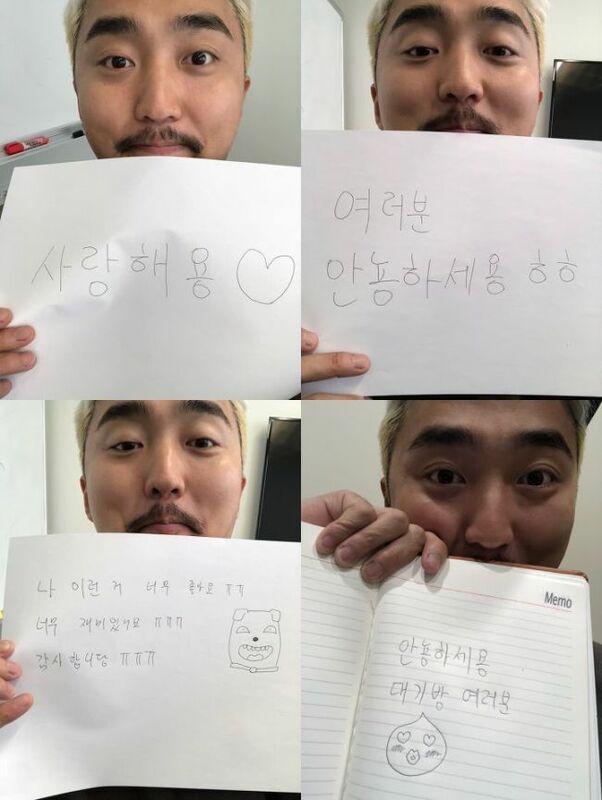 Korean comedian Yoo Byung-jae sent various selfies of himself holding message boards in one room dedicated to him. 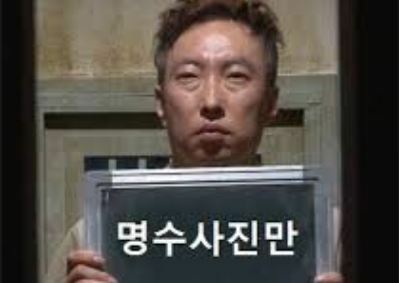 Comedian Park Myung-soo also shared a picture with a message note saying “I love solitary Myung-soo.” K-pop stars such as Mamamoo, Sulli, Yang Yoseob and Park Kyung have also joined their chat rooms and sent selfies. There are no exceptions, however, as the celebrities themselves can be expelled from the chat room if they break the one simple rule. 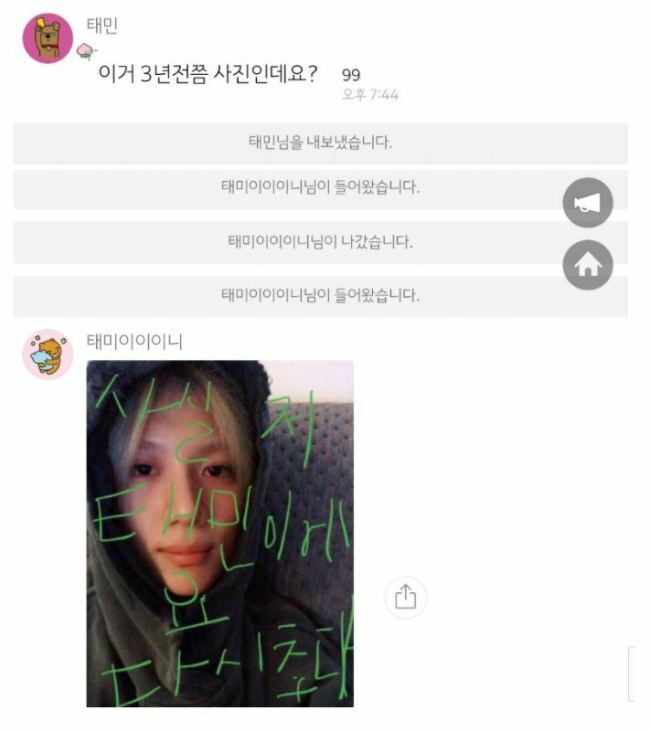 SHINee’s Taemin entered the “solitary Taemin chat room” on Feb. 23, but immediately was kicked out after he sent a text message to fans. He again went into the chat room and sent a selfie with the message “I’m the real Taemin, so please invite me again” on the picture.